Brean Down hillfort comprises a bank and outer ditch at the east end of Brean Down. In the C18-19, before quarrying, it was described as a square earthwork. Referred to as a hillfort, occupied by a derelict army camp, which may be connected with the Roman or post-Roman occupation of the temple site (PRN 10117). 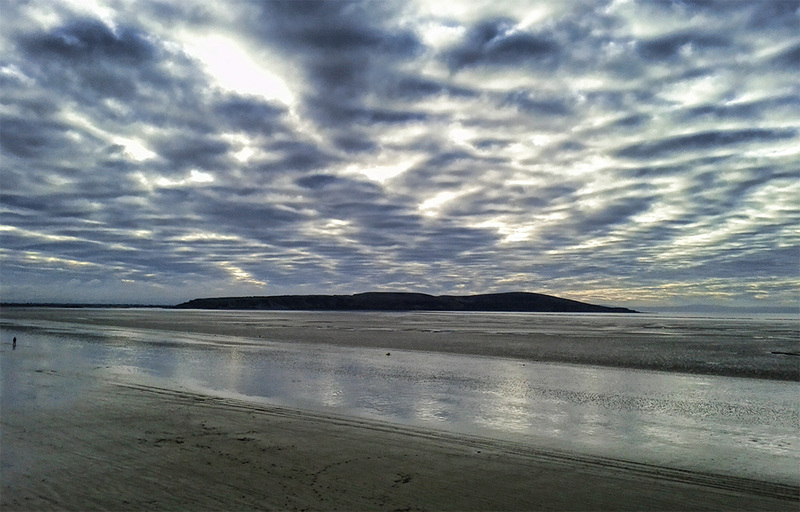 Brean Down at low tide. Henry Rothwell. During quarrying a number of Roman finds were made including gold coins of Augustus, Nero, and Drusus, two silver denarii of Vespasian and a Roman cornelian ring. All are now dispersed. The principal feature of the earthwork is a bank and rock cut ditch running N-S across the ridge. At its S end the bank turns E and follows a natural fault line along the top of an outcrop. Some disturbance of the earthwork was caused by WWII military installations (see PRNs 12362, 12380). It is not a hillfort in the usually accepted Iron age fashion. A small excavation in 1974 disproved the proposed post-Roman date, see PRN 17220. There are no clear indications of defences on the N side, though they may have been destroyed The simple gap in the centre of the W side may be original but it is now occupied by a military road and is not mentioned in earlier accounts. Ditch 5m wide and 1.25m deep with a bank on the E side. This is 5m wide and 1.5m high, built of stone. The bank is topped by the remains of a drystone wall of large irregular blocks with only one course apparent. There is a small amount of bracken but generally free of vegetation. Rescheduled as part of larger area with new national number on 17/9/1993. Previously Somerset 217. OS map reference: ST 298 589. Nearest town/village: Brean.